Canon City, Colo. (AP) – The co-owner of a dinosaur-themed park in southern Colorado thinks an electrical malfunction caused a life-size animatronic Tyrannosaurus Rex to burst into flames. 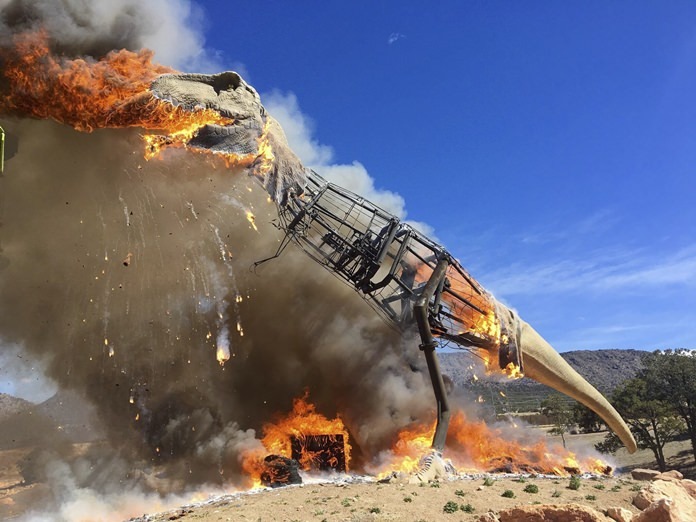 Zach Reynolds says the T-Rex at the Royal Gorge Dinosaur Experience smoldered for about 10 minutes before it caught fire Thursday morning. Visitors watched as the inferno spread through the dinosaur, which appeared at times to be breathing flames. Reynolds joked, “We knew he had a temper, but today he blew his top.” The 24-foot-tall (7-meter-tall) T-Rex, which moved and made sounds, was one of 16 dinosaurs that line the park’s Wild Walk exhibit. Reynolds says it was a total loss but at least “it made for some spectacular imagery along the way.” He hopes to have a replacement T-Rex installed by the summer. Stroudsburg, Pa. (AP) – Punxsutawney Phil is a wanted … groundhog. A Pennsylvania sheriff’s officer has put up a wanted poster for Phil. The handlers of the groundhog last month said the furry rodent called for six more weeks of winter after seeing his shadow. The Monroe County Sheriff’s Office says that expired last week, yet a spring storm brought more snow to the Northeast on Wednesday and Thursday. Cpl. Scott Martin tells WBRE-TV he created the poster and placed it on the “wanted wall” because he is sick of snow in the spring. The poster claims Phil is wanted for deception. Phil is described as having “brown and grey hair, brown eyes, sharp teeth.” Records dating to 1887 show Phil has predicted more winter 103 times while forecasting an early spring just 18 times.